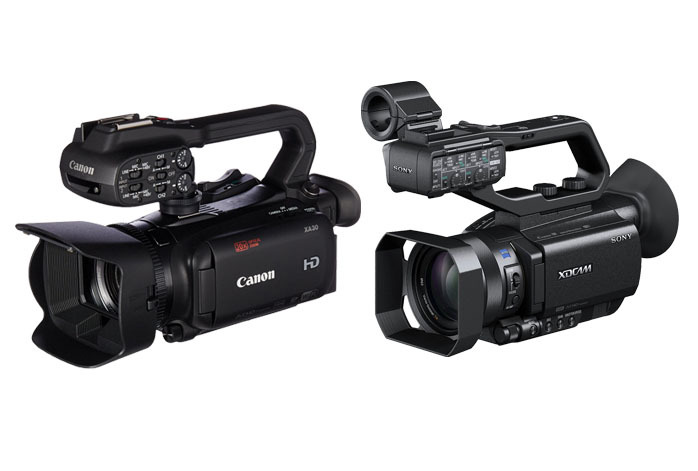 Canon XA30 and Sony PXW-X70 are currently among the most popular professional camcorder models on the market. They both offer such top-notch performance and output quality that they become the choices of many professionals and experts in the field of video making and production. Now, if you are planning to upgrade your camcorder into either one of these two options, you have come to the right place! Below, we will see the comparisons between Canon XA30 and Sony PXW-X70 so that you will be able to determine which model is the best value for the bucks! In terms of recording quality, both models actually perform a very good job of reproducing high-quality images and sounds, thanks to their sophisticated internal engines. However, Sony PXW-X70 comes out to be better than Canon XA30. Canon XA30 is powered by the 3.09 MP Advanced HD CMOS Pro image sensor and allows up to 35 Mbps recording quality. On the other hand, coming armed with a 20 MP 1.0-inch Exmor R CMOS image sensor, Sony PXW-X70 effortlessly capture every subtle detail in the view with exceptional sharpness and crisp. The sensor area is also relatively wider than most other camcorders’ sensors, and this is very beneficial in enhancing the color depth, accuracy, and dynamic range. In addition, Sony PXW-X70 can also record with a maximum bitrate of 50 Mbps in the XAVC format. There are also AVCHD and DVCAM recording formats available. FYI, Canon XA30 vs. XF100. Both models have decent zooming power. However, if you really need high magnification levels, Canon XA30 may be more convenient than Sony PXW-X70. Well, Sony PXW-X70 actually offers up to 12X optical zoom. If you need more, there are 24X Clear Image Zoom and 48X digital zoom. However, Canon XA30 offers up to 20X optical zoom and 400X digital zoom. The extra power may not be needed by all people, but is crucial for specific purposes such as recording sports events. Quite interestingly, Canon XA30 and Sony PXW-X70 each is equipped with a 3.5 display screen. Canon XA30 features an OLED screen, which is of better quality than Sony PXW-X70’s LCD screen. However, Sony PXW-X70 comes with a 0.39” OLED electronic viewfinder while Canon XA30 only has a 0.24” LCD electronic viewfinder. In general, we recommend you to choose Sony PXW-X70. The most crucial factor is, of course, the better recording quality. The better EVF also makes a good plus point. Canon XA30 is viable if you really need the extra zooming power.